We made it up the mountain. Our train pulled into the little town of Gol, and with no advance warning, we were told to get off. From Gol, buses would take us around the spot where the previous day’s train derailment had happened. We were still hoping to catch our fjord cruise. I asked a second bus driver. I asked a third bus driver. “Try asking one of the other drivers,” he said. We gave up on the fjords. We stowed our bags under the bus and stood in line to get on. As we stepped into the aisle, it became apparent this bus had around 50 seats, and about 982 people were trying to sit in them. I asked the driver if there were other buses we could catch. “That bus over there,” he said. He pointed to the first bus -– the bus we had been told not to get on. “Get on that one,” he said. As I took my seat in the other bus, I started to get that nauseous, “Something isn’t right,” feeling. I probably wasn’t supposed to open the luggage compartment under the other bus, but hey, I’m a trained professional. So I pretended I was allowed to, which was a dumb move. When you look like you know what you’re doing, people want you to help them. A lady came running up to me. She pointed to a different bus from ours. “Oh,” she said, glancing at the name tag. She poked her head into the luggage compartment. “That’s my bag!” she said, grabbing the next black bag she could find. She went to her bus. I went to our bus. For the next couple of hours, we climbed higher into the mountains. Snow was coming down hard. At one point we passed a house buried up to its roof. But then the sun started peeking out. Slowly we dropped down to sea level. The next thing I knew, we on a road alongside the fjords. The same scenery we had wanted to pay a hundred bucks for, we were now seeing for free. We passed through the town of Flåm, too late to catch the boat. 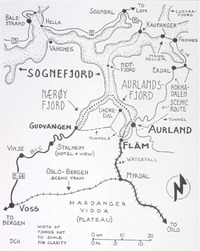 Then we went back into the mountains, up to Voss, where rumor had it we would be put on trains the rest of the way to Bergen. Suffice it to say that after watching two other bus drivers argue about whether or not to take us to Bergen, after missing a bus connection in another small town due to an improperly marked bus, we arrived in Bergen a mere six hours behind schedule. A mere six hours? Yes. Our flight home wasn’t so efficient... and I swear the riots in Copenhagen were not my fault.